I don't keep as many species as I used to but I still breed a few dwarfs. If you are interested in the fish I offer check out my list of Dwarf Cichlids For Sale . Dormant but not dead! Although I have been doing few updates, I am still maintaining this site. For the first time in years I have added a new species profile Apistogramma hoignei is a rarely seen apisto. Hopefully I can continue to add some new pages at times. I've been meaning to recommend Tom Christoffersen's article Collecting in the R�o Tahuayo and the R�o Tamshiyacu drainages 2011. In it, Tom recounts his search for the different forms of Apistogramma panduro. Its an excellent photo essay so check it out. If you enjoy reading about collecting expeditions be sure to check out our collecting dwarf cichlids page where I have a host of stories and information about collecting in the wild. After a very long break I have posted a new fish profile today. Apistogramma baenschi is a great fish. It is easy to keep and breed, very beautiful and is typically out in front and easily seen. I have been keeping this species for several years and it has become a favorite of mine. There are well over 300 different species, subspecies or forms of Apistogramma and it is almost impossible for any one person to be familiar with them all. Fortunately for us all, Mike Wise is one person who not only keeps up with every form and variation but understands how they all relate to each other. Mike has provided an incredible service to us all by publishing his Apistogramma Species List By Species-Groups/Complexes August, 2011. This is the definitive listing of Apistogrammas and if you are serious about these fish you will want to bookmark and save this page. You are never too young to fall in love with dwarf cichlids and many young people enjoy keeping and breeding them. However, for most, the thought that they might someday collect their own Apistogrammas in the wilds of the Amazon is only a dream. For one young hobbyist the dream became a reality and Hudson, from Manaus, Brazil has taken a great interest in dwarf cichlids at a young age. He has started his own blog and has recently put on a page describing his collecting trip to the Amazon river near the village of Itapea�u. You can read the complete description of this and other collecting trips he has made at Hudson's World. I've always wanted to go on a fish collecting expedition but never have. I console myself by reading the accounts of others and have put together a page of resources about collecting dwarf cichlids. There are lots of stories of collecting trips along with a listing of expedition providers as well as some other interesting info. If you have ever wondered about a fish collecting trip check this page out! Question: I saw a picture of an Apistogramma that I really want to get. It is called a flaming red dwarf cichlid. I have not been able to find these for sale. Do you have any? Answer: The fish you saw was probably an aquarium form of Apistogramma agassizii. There is a strain that has a bright yellow to white body with bright reds in the tail and fins. The mix of colors can vary widely as can the name they are sold under. Look for red flame, fire red or red fire agassizii and you will likely find fish similar to what you saw in the photo. Question: I noticed that you suggest to put oak leaves in the cichlid tank. I was just wondering if any type of oak leaf would work? I'm from Nebraska and we have a lot of bur oaks. Would these leaves be ok in my tank? Answer: As far as I know, every type of oak leaf will work just fine. I have used Bur Oak leaves a lot and I know that they will work fine. They will last in the tank for a couple of months before they start to significantly deteriorate. Question: What brand of flake food do you recommend? Answer: I don't feed flake food to my fish. I use so many floating plants that floating foods don't work for me. Instead I use sinking pellets to feed my Apistogrammas and other fish. If they worked for me I would not hesitate to feed flake as almost all of the flakes on the market today provide good balanced nutrition for your fish. Rather than brand I would focus on freshness and variety. Once you open the food it begins to lose quality. After 6 months it has lost a lot of the quality of new. My advice is buy small containers of food and use them as quick as possible. If you have old stale food throw it away and get fresh. You can read more about how I feed at Good Food and at Equipment. January 2015 Ever since the Pipe Expedition brought back photos of the amazingly colored Apistogramma "gigas" hobbyists have wondered if the species was truly an Apisto. The fish has now been described as Apistogramma kullanderi. September 2013 Apistogramma aguarico sp. n. is a newly described species from Ecuador that is a member of the Apistogramma eunotus complex of the Apistogramma regani group. At this time it is unlikely that the casual hobbyist will encounter this species. July 2012 Apistogramma allpahuayo is now the official name for the fish that has been known as A. sp. Back Chin. Often confused for A. jurensis this fish is often available from specialty importers. December 15, 2011 Apistogramma playayacu sp. n. has recently been described by Uwe Romer, Joscha Beninde & Ingo Hahn. This species is only known from a museum collection and has never been in the aquarium hobby. However, detailed collection information is available to the adventurous collector. 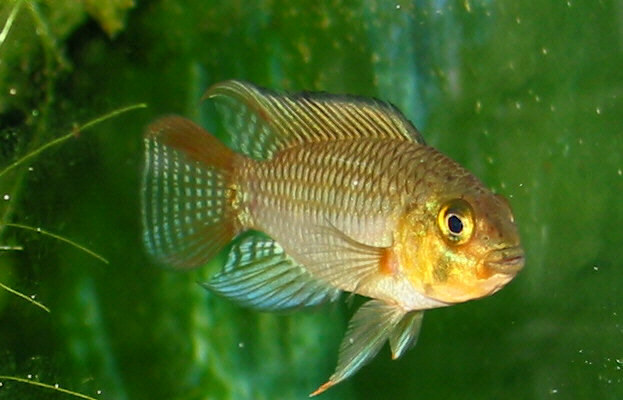 April 14, 2011 Apistogramma cinilabra has recently been described By Uwe Romer. This is a species that has been in the hobby as A. sp. Schwarzbrust/Black-breast. However, it has not been widely distributed. September 4, 2010 Dicrossus foirni and Dicrossus warzeli are two newly described South American dwarf cichlids. Each of these species has been in the hobby for a number of years so it is good to have them finally named. August 7, 2009 Enigmatochromis lucanusi is now the proper name for the fish the hobby has known as Pelvicachromis sp. ?blue fin?. The species was thought to be closely related to Pelvicachromis roloffi but the describer, Dr. Anton Lamboj, judged the fish to be unique enough that he actually created a new genus for it. May 18, 2009 Laetacara araguaiae is now the correct name for the fish that the hobby has known as Laetacara sp. "bukelkopf" following its formal description by Felipe P. Ottoni & Wilson J. E. M. Costa. Along with their description of the pair also re described Laetacara dorsigera. Along with the clarification that this article provides, it also creates some confusion as the authors mention another species, L. minutacara, without any info as to what this species might be. We can only hope that this is another description that they have in progress. November 23, 2008 Apistogramma erythrura is a newly described species that has been in the hobby for some time as Apistogramma sp. Mamore. This is a very attractive Apisto that is most closely related to Apistogramma trifasciata. The species has been in the hobby since 1995 when it was introduced in Germany. The description is interesting reading for dwarf cichlid fans and includes several nice color photos. Apistogramma and other dwarf cichlids evoke great passion among many fish keepers. Apistogrammas are the most popular dwarf cichlids but all are great aquarium fish that come in a rainbow of colors, exhibit fascinating behavior and can usually be kept in a community aquarium. There is no strict definition of what a dwarf cichlid is but generally speaking they are small sized and relatively peaceful. Typically, most dwarf cichlids are no more than about 3 inches in length although many never get that large and a few get somewhat larger. Dwarf cichlids are found in both South America and West Africa. South American dwarf cichlids include Apistogramma, Apistogrammoides, Biotoecus, Crenicara, Dicrossus, Laetacara, Nannacara, Mikrogeophagus and Taeniacara. There are more species of Apistogramma than the others combined but the Blue Ram cichlid, Mikrogeophagus ramirezi, is not only the most popular and widely kept dwarf cichlid but an all time favorite among all tropical fish. This fish was once known as Apistogramma ramirezi but it is not an Apistogramma species. Pelvicachromis and Nanochromis are the two most popular genera of West African Dwarf Cichlids. The Pelvicachromis species are generally more available than the Nanochromis.The ever popular Krib or Kribensis, Pelvicachromis pulcher, has long been a popular tropical fish and cichlid lovers have kept them in their aquariums for many years. If you have never kept dwarf cichlids Kribs are a great first choice. The information we provide about keeping and breeding Apistogrammas and other dwarf cichlids includes sections on foods & feeding, aquarium set up, aquarium maintenance, aquarium plants, fish health and much more. One of the biggest problems with Apistogrammas and other dwarf cichlids is finding them! Check out our Buying Fish section for information on where to find these exotic tropical fish. You can find a lot of information about Rams, Kribs, Apistogrammas and other dwarf cichlids on the Internet. However, I strongly recommend that you purchase one or more of the books available. Visit our book reviews to learn about the books that are available. Finally, several times a month I get a smile when I check my mail and discover a new issue of one of my favorite aquarium magazines has arrived. Reading these great magazines each month helps to keep me energized and inspired. If you want to enjoy your hobby more I strongly recommend subscribing to one of the excellent publications available. You can read my thoughts about them in our magazine reviews. Most of the magazines have Apistogramma articles at times and general dwarf cichlid information is frequently presented. Dwarfcichlid.com - practical advice about keeping, breeding and buying Apistogramma, Mikrogeophagus and other dwarf cichlids.